It’s Valentine’s in a few days. And to think that it was New Year’s Eve only a few weeks ago. It goes by so fast. How do you normally celebrate this occasion? Or do you not celebrate it? I usually celebrate with family and dine out because we love to eat. And eating out makes us happy. For some people, Valentine’s may be a sad time. It could be a reminder of their past relationships or a reminder that they wish they were in a relationship. Valentine’s is a holiday that the media highlights as a celebration with someone you’re in a romantic relationship with. That’s how some people would like to celebrate it. And that’s okay because it’s what they want. This year, I’ve seen more posts about Galentines or Palentines. This means celebrating Valentine’s with your friends. 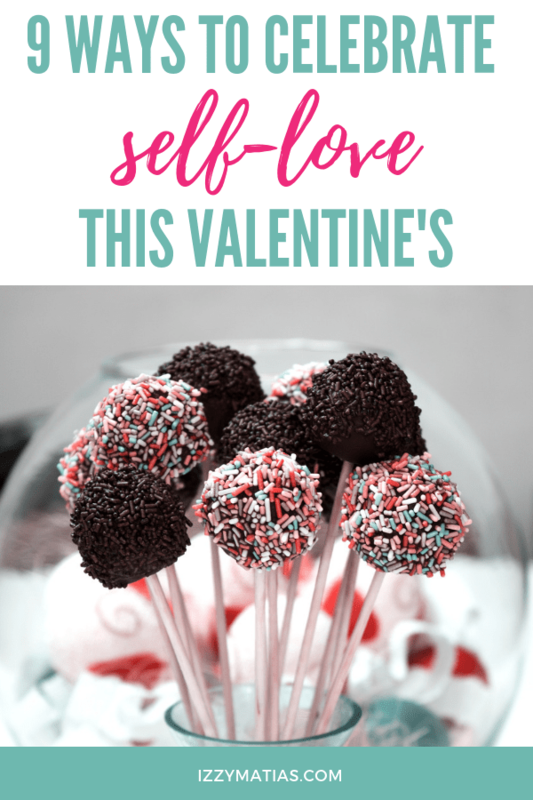 I am all for celebrating the love of friendship, but why not celebrate the love for yourself? This is not meant for you to be narcissistic, but I have noticed that we can be our own worst critic especially if we have such high expectations of ourselves. If you’re a perfectionist (like me! ), chances are you tend to take mistakes or failures deeply and on a much more personal level. It sometimes can feel like the end of the world when you’ve given your all and don’t get the results you hoped for or you messed up big time. Even if you tried so hard not to mess up. This Valentine’s, go ahead and celebrate with your girlfriend, boyfriend or best friends, but please also remember to celebrate yourself and do something for you. Whether it’s on Valentine’s day itself or not, take the time for you. Ask yourself what you want and make time for it. What is something you’ve been wanting to do, but haven’t had time for? Is it an afternoon at the spa or driving out to the beach to swim and watch the stars? Is it a social media detox? For me, it’s a whole day away from social media and to have my mind off of all kinds of work because I’ve been feeling burnt out again lately. I’ve noticed the signs and I want to prevent me spiraling back into a negative state or anxious state again. I’m going to take a much-needed reset and put my phone on airplane mode and stay away from social media. Maybe I’ll take a spontaneous trip to the beach so I can really clear my mind. Eating well gives you the energy to do the tasks you need to accomplish for the day. Sometimes, when you’re busy you may opt to go for the faster, but not so healthy choice such as fast food. Indulge in a good, healthy meal. When I say indulge, I don’t mean binging because that’s not healthy. Choose a dish that comforts you. If possible, choose a meal that’s healthy and good for you. However, you might be thinking of going for that hamburger meal–your comfort food. That’s okay too, but I hope you make a conscious effort to choose a healthier lifestyle even if it’s as simple as increasing your daily vegetable intake. I’m sure you’ve heard it before that exercise is vital to a healthier you. But what if you don’t enjoy going to the gym or you’re not the athletic type? You can walk around your village or walk to the park. Don’t forget to take your fluffy loved one with you for an extra dose of snuggles and love hormones! Valentine’s is one of those occasions where people give gifts to each other. Practice self-love by buying something for you. If you’ve been wanting that spa day, buy the package and schedule it. If you’ve been eyeing the latest self-help book you saw at the bookstore the other week, buy it. It doesn’t have to be something big or extravagant. Even the little things count. Do this especially if you’ve been skimping on spending your money lately. I know the feeling of being strict with spending and after a while, I felt exhausting. That’s because I kept saving and investing, and not treating myself once in a while. Maybe you can even set aside money each month to treat yourself. That way it’s already part of your budget and you won’t feel guilty digging into your savings. Personal development, yo! The two things I don’t mind spending money on are education and food. I really believe in always learning and working on one’s self. However, even if you have a mentor, if you don’t put in the work, then you can’t expect real growth. This may be a challenging exercise for some, but so crucial because you have to remind yourself about your good qualities. Include a list of things you’ve done that you’re grateful your past self has done. For example, you invested in health insurance or you started building your retirement fund as soon as you started working. You’ve got a lot of goals you want to achieve and unless you take action, then those goals will remain goals. Ask yourself what you do on a daily basis that move your goals forward. Review your vision board and if you can track your goals, then much better. For example, if your goal is to get your first 100 subscribers on YouTube, then check if you have an action plan in place. Do you update your channel weekly? Do you keep track of how many subscribers you have? What do you do to help you grow your channel? It’s so easy to stay stuck in a routine that includes a negative habit because you’ve gotten used to it. It’s something familiar. Cultivating healthier habits take time, patience and dedication. This healthy habit could be injecting a minute of meditation a day. As mentioned, you should track your progress. Keep a log book or a page where you write down if you’ve meditated daily. When you track something, there’s more accountability. You even ask a friend to be your accountability partner. I might sound like a broken record, but mindset matters. If you feel like you’ll never achieve your first 100 subscribers, then you’re likely to give up easily because you already have the mindset that you’ve lost. I know that changing one’s mindset is one of the hardest things because it’s a constant struggle for me, too. It’s easier to stay negative when you’ve already gotten comfortable in that cycle of thoughts. It takes energy and effort to turn those negative beliefs into positive ones. What I do is to have positive affirmations that I tell myself. For example, when I feel a panic attack coming, I repeat to myself, “I am safe and I am calm.” It distracts me from thinking about my heart beating faster than normal. I also have a vision board where I’ve posted reminders to stay positive as well as what specific actions I’ve committed to make my goals into a reality. So this Valentine’s, please prioritise YOU. Maybe you’ve been putting your work or other people ahead of you. Take the time to prioritise yourself and your health. Great blog post, Izzy! Every day is a great day to spoil yourself, but I’ll definitely be eating all of the food for Valentine’s Day.